A video with Alberto and Rey Mysterio aired prior to the match, saying hello to the fans and saying they'd be wrestling in Mexico City soon. Prior to the second match, Konnan & Cibernetico came out to talk about how their alliance was going great and invite Mesias to join them. Mesias did not say anything but did seem to reject the offer. Demon beat Averno in the match - then Mesias speared Parka thru a table in the corner after the match, apparently joining the alliance after all. Hell Brothers beat up the tecnicos, with Cibernetico taking Demon's mask. Bonus match 2. Pimpinela cradled Mini Abismo after the usual Hijo del Tirantes attack. Fantasma, Pentagon and Joe Lider immediately beat up the tecnicos after the match. Pentagon threatened Rey, while Fantasma said he'd beat Fenix. Drago defeated Hijo de Pirata with mist in the eyes and his usual cradle (Dragon's Tail on Lucha Underground). 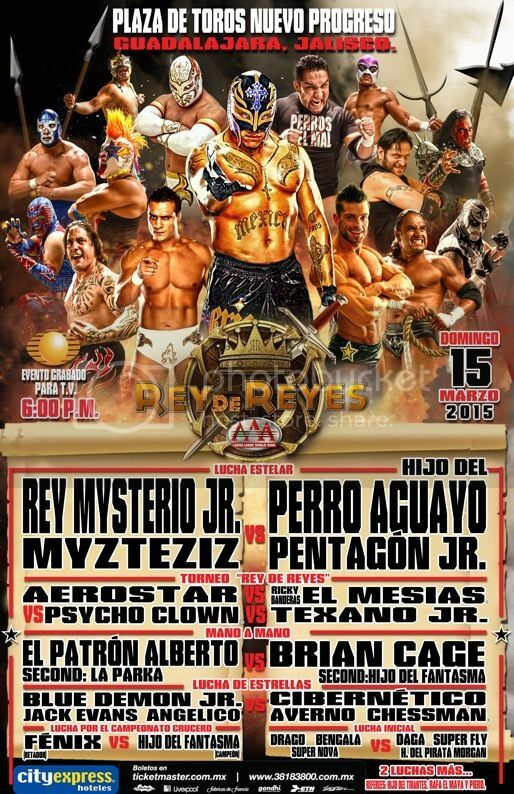 Great match, with Fantasma surviving Fenix's Fire Driver and using it himself for the win. Fantamsa's third defense. Fantasma insisted on handshake after the match, but Fenix wasn't down with it. Fenix accepeted - only for Fantasma to attack him a few seconds later. Dorian, Konnan, Taya and Perro came to the ring to brag and congratulate Fantasma. The rudos eventually started to attack the tecnicos again, and Rey Jr. appeared to make the save. 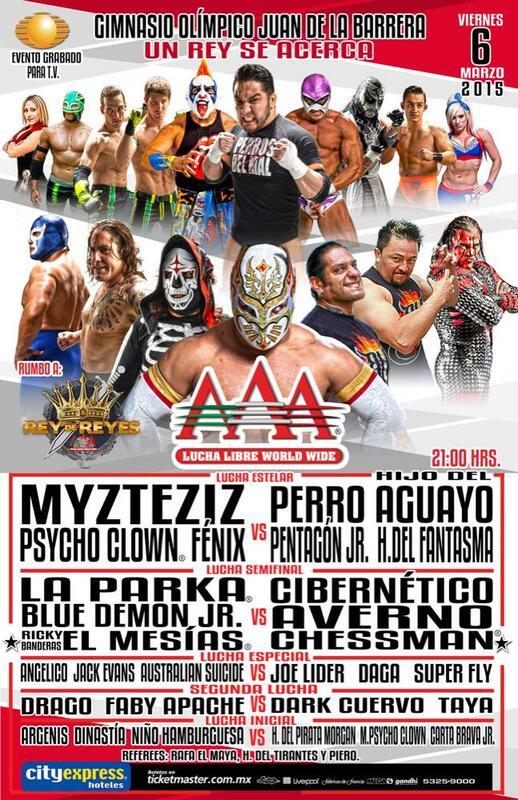 Announcers were sure Rey was joining the Fenix/Myzteziz team. Replaced a canceled Alberto del Patron vs Brian Cage match. An echo of their match from last year, though they seemed to get more time and had a slow start as a result. Their punching woke the crowd back up. Both men bled and brawled. Demon submitted V4 for the win. They challenged each other to another match - a mask one - someday. Money thrown in. La Parka replaced Blue Demon Jr., but Demon lent a hand (or a chair shot) to beat Cibernetico. Mesias immediately ran out to attack the tecnicos, leaving them destroyed and taking Parka's mask. Event Notes: Show was scheduled for outdoors on March 15, but rained out. Show was moved indoors on March 16, but the necessary permits could not be done in time and the show was postponed until March 18th. In between, AAA's staff bus was in a bad accident returning to Mexico City. One person (Irma Osorno) passed away and many were injured.